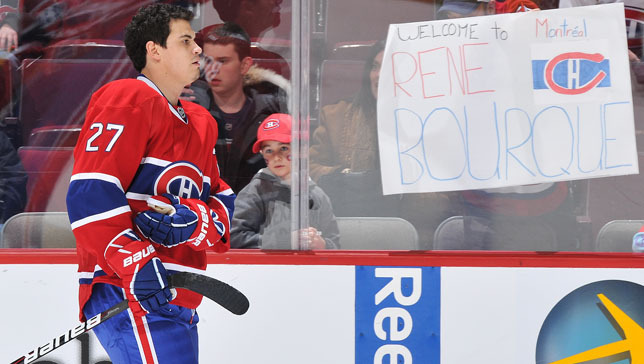 Settling in: Having only arrived from Calgary last Friday night, newcomer Rene Bourque has been doing his best to rapidly adjust to a new city and a new team, making the most of a Monday away from the rink to get to know each a bit better. “The last three days have all been pretty busy ones. I got the chance to walk around the city a bit and I’ve of course also been trying to find a place to live. Some of the guys took me out to dinner, and I think things have been going pretty well so far,” said Bourque, whose Wednesday night outing against Washington will mark only his second game back since serving a five-game suspension for an elbow to the head of the Capitals’ Nicklas Backstrom. Rene Bourque prepares to face the Washington Capitals. Back-up: While the Capitals may look to make a target out of the Habs’ newest power forward in Wednesday night’s tilt, Josh Gorges and the rest of the Canadiens have no plans to let Bourque deal with the situation alone. “It’s a little different because we weren’t there originally. Maybe someone will come after him and challenge him or something like that but he’s on our team and he wears the same jersey as us so we’re going to be there to back him up if he needs it,” promised Gorges, while also mentioning that with games this week against the Eastern Conference’s seventh, eighth and ninth place teams, the Habs’ plan to bear down with everything they’ve got. Carpe diem: Mike Blunden may still have a ways to go before he can consider himself a veteran of the NHL, but after 22 games with the Habs this season, it’s clear he’s starting to find his niche within the team. Working to prove himself as a reliable physical presence since being called up from Hamilton, the Ontario native found himself flanking Tomas Plekanec and Rene Bourque during the team’s Tuesday morning practice. “This is the first real occasion that I’ve gotten to play in the NHL. I got a little taste of it when I was playing under Claude Noël in Columbus, but I’d say that this has been my first real opportunity,” expressed Blunden who had logged a total of 51 NHL games before becoming a member of the Canadiens.